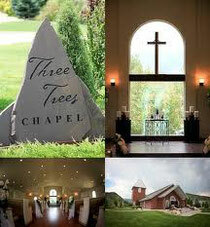 If you are dreaming of that perfect mountain Chapel, with a truly romantic feel and the most spectacular views in Denver, then look no further than Three Trees Chapel. This gorgeous venue is perched on its own hill and peers out over the scenic foothills and valleys of the Front Range. Three Trees Chapel is the perfect intimate setting for a party of 2 or 200. Decorated in warm colors, rich hardwood floors and picture windows framed in fine crafted stonework, the Chapel and reception room illuminate the ambiance and sophistication of a mountain resort, without the inconvenience and expense of traveling.